Welcome to a Vegetarian Hostel! In order to save the earth, we advocate a vegetarian life. We offer the real vegetarian meal to any guest who are vegetarian. Baced on Chinese Box, you can explore more interesting places and experience the city's distinction and glamour. Finally, you will find Chinese Box is not only a hostel but also a 'travelers' home'. 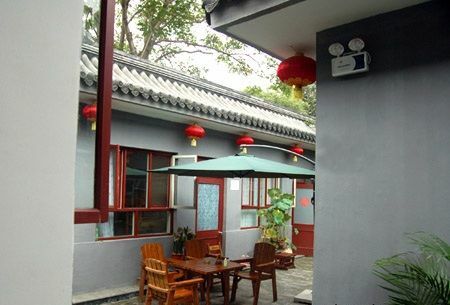 1, * Free vegetarian salad party(Mon) * Family vegetarian dinner (Wed.)* Free vegetarian dumpling party (Fri.)* Professional & Traditional Chinese Kongfu Tea Course (afternoon)Welcome to Chinese Box Courtyard Hostel, a traditional Beijing courtyard. 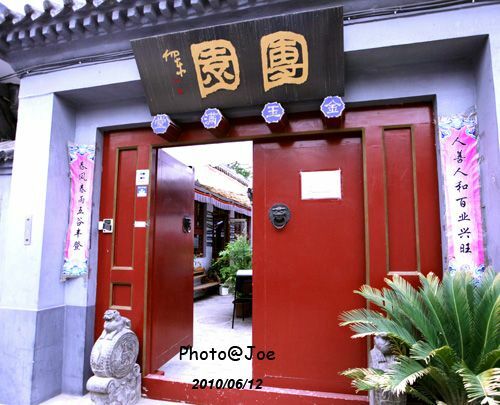 We spent quite a few years traveling around most parts of China, so with these precious traveling experience, we know very well how to entertain backpackers with a clean and comfortable place full of fun.---------- ORIGINAL TASTE AND FLAVOUR ----------Chinese Box Courtyard Hostel has been carefully and originally preserved with a traditional Si-He-styled house, and nestled in the designated historic landmark Hu-Tong neighborhood (500-year-old) well protected by Beijing government. Its quiet and peaceful, and of course, very safe. ---------- NICE LOCATION ----------If you are looking for a definitely cozy and convenient stay, this is it:Within only 5-minute walking you can reach one of the subway stations, quite a few Chinese restaurants with delicious pecking duck, dumplings, etc, a hilarious local market, a super market (08:30-22:00), several 24-hour convenience stores, a fruit market, tea shops and so on.----------FREE SERVICE ----------* FREE breakfast* FREE Internet and Wi-Fi* FREE 24-hour hot shower* FREE luggage storage* FREE towels, linens and duvets* FREE DVDs to borrow (hundreds of DVDs) and play* FREE games to borrow * FREE books to borrow including guidebooks such as LP series * FREE air ticket booking* FREE travel information* FREE hostel booking in China----------HOSTEL TOURS----------* The Great Wall ( Jinshanling to Simatai hiking, Mutianyu,etc) -- Discount, breakfast and lunch included* Show tickets with discount (kungfu, Peking opera, acrobatic show) * Camping tour ( ask for reception )* Tibet tour booking and organization ?email us if you are interested )----------HOSTEL ACTIVITIES----------* Free vegetarian salad party (Mon) * Family vegetarian dinner (Wed.)* Free vegetarian dumpling party (Fri.)* Free tea ceremony in the afternoon* Chinese language teaching and practice* Chinese Majiang teaching and play----------VOLUNTEER WANTED----------Finding hostel jobs abroad is a great way to save or supplement your travel funds and to stay on the road longer. You won't get rich from it, but you'll have more life experience and meet more interesting people than the average cubicle dweller! 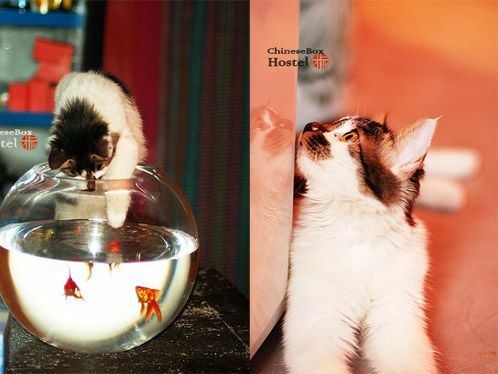 If you are a Spanish or Japanese native speaker, please feel free to email us!Chinese Box Courtyard Hostel is always willing to be your best companion, thinking about what you care and making your journey as easy as possible...Bachelors degree, From U.S, Canada, New Zealand, Austrailia, U.K, South Africa ----------Experience Chinese Culture via Tea Ceremony & Calligraphy ----------Watch a graceful ceremony,and find out the meaning of Chinese philosophy by sips.Enjoy a brilliant performance, and learn from calligraphy mastersthrough participation.Come and join us to explore the authenticity of the ancient civilization9?30-11?30am Every SundayPlease contact us for more informationEmail: oldhutong@gmail.com -----------ADDRESS:------------Chinese Box Courtyard Hostel, No.52 Xi Si Bei 2 (er) Tiao, Xi Si, Xi Cheng District, Beijing, China. ?Subway Line 4: Xisi station Exit A, go towards nothern, turn left at the second Alley)????????????52??????????A???????????? ADD: ChineseBox Hostel, No.52 Xi Si Bei 2 (er) Tiao, Xi Si, Xi Cheng District, Beijing, China.Subway Line 4, Exit A, turn left to the 2nd alley, left again, pass a 300-year tree, to No. 52. it takes 5 minutes walk.????????52??????????????????????????? ** PLEASE READ THESE DIRECTIONS FULLY TO AVOID ANY PROBLEMS GETTING TO THE HOSTEL. PLEASE REMEMBER TO PRINT OUT THE MAP - IT HAS OUR CHINESE ADDRESS AND PHONE NUMBERS **????????????????????????????? ?FROM THE BEIJING INTERNATIONAL AIRPORT: (By Subway)? Take the airport subway to the last station at Dong Zhi Men (25yuan).? Transfer to the subway line 2 to Xi Zhi Men station.? Transfer to the subway line 4 to Xi Si station, leave the subway at exit A.? Turn left, walk north to the 2nd hutong (alley) - Xi Si Bei 2 tiao about 2 minutes.? Turn left and walk west about 3 minutes.? Our hostel is located at the left hand side..(By Taxi)You can also take a taxi from Beijing Airport (around 100RMB). Just tell the driver that the destination is Zhao Deng Yu Road (close to Xi Si Bei 2 Tiao). It will take about 1 hour, 100 yuan..FROM THE BEIJING CENTRAL RAILWAY STATION: (trains arriving from Mongolia, Russia etc. )(By subway)? Take subway line 2 to Xuan Wu Men station? Transfer to the subway line 4 to Xi Si station. (2 RMB), leave the subway at exit A.? Turn left, walk north to the 2nd hutong (alley) - Xi Si Bei 2 tiao about 2 minutes.? Turn left and walk west about 3 minutes.? Our hostel is located at the left hand side..(By Taxi)? It costs about 20RMB from the Central Station to our hostel. Just tell the driver the destination is Zhao Deng Yu Road (close to Xi Si Bei 2 Tiao). It is pretty fast and easy.FROM THE BEIJING WEST RAILWAY STATION: (trains arriving from Xi'an, Chengdu, Pingyao, Datong, Hong Kong etc. )(By Bus)?Take bus No 823 or 83 and get off at XiSiLuKouBei stop?Cross the main road, Walk north to Xi Si Bei 2 tiao about 2 minutes.? Turn left and walk west about 3 minutes.? Our hostel is located at the left hand side. (By Taxi)? It costs about 20RMB from the West Railway Station to our hostel. Just tell the driver the destination is Zhao Deng Yu Road (close to Xi Si Bei 2 Tiao). It is pretty fast and easy.FROM THE BEIJING SOUTH RAILWAY STATION: (trains arriving from Shanghai,Tianjing,TsingTao etc. )(By subway)? Take subway line 4 to Xi Si station. (2 RMB), leave the subway at exit A.? Turn left, walk north to the 2nd hutong (alley) - Xi Si Bei 2 tiao about 2 minutes.? Turn left and walk west about 3 minutes.? Our hostel is located at the left hand side..(By Taxi)? It costs about 20RMB from the South Railway Station to our hostel. Just tell the driver the destination is Zhao Deng Yu Road (close to Xi Si Bei 2 Tiao). PLEASE NOTE: If you have any problems or get lost, please phone us - many small newspaper shops have a phone you can use. Taxi drivers do not always know the best way to reach the hostel, so it is best to ask them to phone us.